Saigon Gate Cuisine uses their own specialised couriers to deliver their food. A mixture of chicken breast fillet, lettuce, mint and rice vermicelli noodles served with home made peanut sauce. Marinated chicken breast fillet with spices served with peanut satay sauce. Quail marinated special Vietnamese lemongrass herbs and spices served with Vietnamese pickle, salt and pepper and fresh lemon. A combination of spring roll, curry puff, fried dim sim and crispy king prawn. Mixture of chicken, onion and carrots stir fried with special spices wrapped in a fresh lettuce leaf. Diced chicken breast fillet cooked with sweet cream corn and chicken stock, thickened and finished with a touch of egg. Strips of chicken fillet cooked with chicken stock, coconut and laksa paste. Strips of chicken fillet cooked with chicken stock and tom yum paste. Mince chicken and prawn wrapped in dim sim pastry cooked with beef stock. Crab meat cooked with chicken stock and asparagus thickened and finished with a touch of white egg and garnished with a sprinkle of spring onion. A mixture of tofu, carrot, cabbage, mint and celery dressed in a Vietnamese fish sauce topped with dry onion, peanuts and coriander. A mixture of carrot, lettuce, cabbage, mint and celery in a Vietnamese fish sauce topped with dry onion, peanuts and coriander. A mixture of tofu, lettuce, mint, cucumber and bean shoots served with Vietnamese fish sauce topped with dry onion, peanuts and coriander. A mixture of spring roll, lettuce, mint, cucumber and bean shoots served with Vietnamese fish sauce topped with dry onion, peanuts and coriander. A mixture of beef, lettuce, mint, cucumber and bean shoot served with Vietnamese fish sauce topped with dry onion, peanuts and coriander. A mixture of chicken, lettuce, mint, cucumber and bean shoots served with Vietnamese fish sauce topped with dry onion, peanuts and coriander. A marinated roast pork, lettuce, mint, cucumber and bean shoots served with Vietnamese fish sauce topped with dry onion, peanuts and coriander. A mixture of prawn, lettuce, mint, cucumber and bean shoots served with Vietnamese fish sauce topped with dry onion, peanuts and coriander. A mixture of grilled pork and spring roll, lettuce, mint, cucumber and bean shoots served with Vietnamese fish sauce topped with dry onion, peanuts and coriander. A mixture of sugar cane prawn and spring roll, lettuce, mint, cucumber and bean shoots served with Vietnamese fish sauce topped with dry onion, peanuts and coriander. Fresh chicken stir fried with Chinese mushroom, spring onion and onion in Oyster sauce. Lightly battered chicken breast fillet dressed with choice of sauces and topped with sesame seeds. Marinated chicken in a mild creamy curry sauce. Battered pork chop fillet fried until golden brown, stir fried fried with capsicum, pineapple and onions in a sweet and sour sauce (plum sauce). Wok shake marinated diced beef with onions in a traditional Vietnamese sauce. Lightly battered fish fillet with a spicy curry sauce and vegetables. Marinated beef with fresh ingredients cooked with Vietnamese sesame sauce served on a hot plate. King prawns with fresh mushroom and onion cooked in a creamy garlic sauce. Marinated duck, roasted boneless until golden brown served with home-made Hoi sin sauce. Fried until crispy served with SaiGon Gate traditional chilli sauce. Fried until crispy served with Vietnamese traditional ginger chilli fish sauce. Lightly battered barramundi tossed with salt and pepper, finished with diced onions, carrots, capsicum and dry onions on top. Steamed barramundi in a Hong Kong style homemade soy sauce, sprinkled with spring onion and ginger slices, finished with a dash of pepper. Stir fried with seasonal green veggies. With onion, capsicum, carrot, celery and spring onion. With seasonal vegetables and cashew nuts. With mixed seasonal vegetables and ginger. With capsicum, onion, carrot and chilli. Flat rice noodles dressed with hokkien sauce and vegetables. Wok fried flat rice noodles in a sweet soy sauce with home made spicy hokkien sauce. Stir fried rice noodles with shallots and bean shoots in a special homemade Pad Thai sauce. Hokkien noodles stir fried with shallots and bean shoots in noodle sauce. Hokkien noodles stir fried in a home made curry with vegetables. Hokkien noodles with shallots, stir fried with home made satay sauce. U-Don noodles, shallots, dried onion and bean shoots in noodle sauce. Stir fried hokkien noodles with teriyaki sauce and vegetables. Stir-fried hokkien noodles with Thai lemongrass sauce and vegetables. 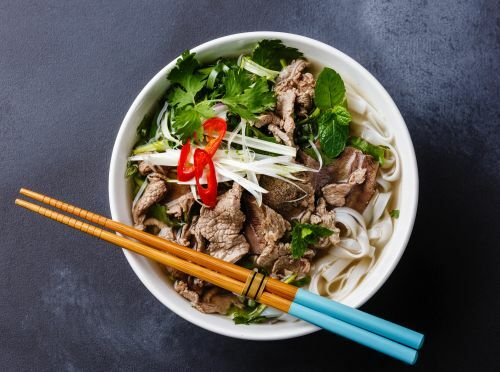 Rice noodles, bean shoots, basil and coriander with our special spicy beef stock soup. Hokkien noodles, bean shoots and tofu in a home made spicy laksa coconut milk soup. Hokkien noodles, chicken, bean shoots and tofu in a home made spicy tom yum soup. Egg noodles, bean shoots and chicken and prawn dumplings cooked with our special beef broth. Rice noodles, bean shoots, basil and coriander with our special beef stock soup. A mixture of diced chicken, onion, carrot and spring onion stir fried with soy sauce. A mixture of diced, chicken, onion and beansprout stir fried with spicy tom yum paste. Diced chicken, onion, carrot and spring onion cooked with rice in a Vietnamese style. Diced chicken, onion and spring onion cooked with diced salted fish and rice in a Vietnamese style.